Shoppers in IKEA are set to have a (very small) taste of "The Prisoner", with their new range of children's fancy chairs. 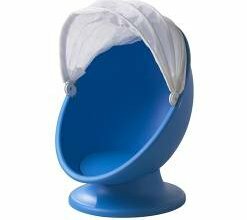 Very reminiscent of the chairs seen in Number Two's office in the series, the new seats, which retail at $79, are small children's chairs with a cloth canopy, to use as a secret play pen. With thanks to Nigel Kitcher for this news item.